The Approver tree is accessed from the Approver Setup page by clicking on the 'View Approver Tree' button. It provides the user with a different perspective of the approver setup. It is structured by Workgroup, Approver and leave types. 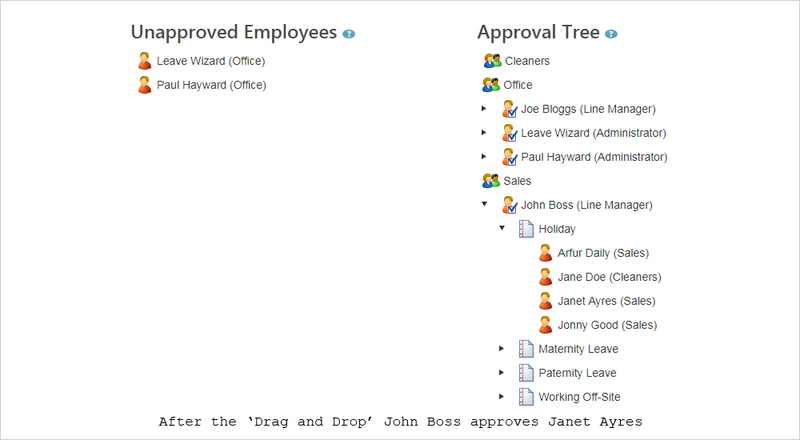 You can 'drag and drop' unapproved employees onto the approval tree to assign the required approvers. Please note however that from August 2018 the approver tree page is deprecated. Clicking this button opens a new tab on your browsers with a link to this help article. Clicking this button returns you to the Approver Setup page. This section has three check boxes and a Drop-down menu which are available elsewhere in the LeaveWizard system but duplicated here for convenience. This check box performs the same action as 'Team Leaders are first level approvers' on the Approver Setup page. If you set up team leaders as approvers then any member of a workgroup will automatically have their leave approved by the team leader. This check box performs the same action as 'Should requests by admins require approval?' in the 'Approvals' section on the 'Company Settings' page. If checked, requests submitted by an administrator for someone else will be submitted for approval. If not, these requests will be automatically approved. This check box performs the same action as 'Users can only see their leave or members of their work group/custom groups' in the 'Restrictions' section on the 'Company Settings' page. If checked, users will be restricted to be only able to see leave for members of their work group and custom groups. This check box performs the same action as 'Who should receive overtime requests for approval?' in the 'Overtime/TOIL' section on the 'Company Settings' page. You can select either Administrators or Team Leaders / Approvers from the drop down box and overtime requests will then go to them. However, if team leaders/approvers is selected and no approvers exist then those requests will go to administrators. The Approver Tree comprises of three columns: Unapproved Employees, Approval Tree and Secondary Approvers which we will describe in detail below. At the bottom of the section there is also a useful graphical key to help identify the different node types: Workgroup, Leave type, Approver and Employee. This section lists all the employees that do not have an approver assigned for one or more leave types. You can double click on the employee name to expand the node and see which leave types do not have an assigned approver. Double clicking again will collapse the node back down. You can 'drag and drop' an unapproved employee onto the approval tree to assign the required approvers. You can also use Ctrl or Shift click to select multiple employees at the same time and 'drag and drop' them onto the approval tree. For example, if you click on 'Janet Ayres' in the Unapproved Employees list and then 'drag and drop' her icon onto the Approver icon of John Boss on the Approval tree her only un-approved leave 'Holiday' requests will then be approved by him. After doing this, as this was the only leave type for which 'Janet Ayres' did not have an assigned approver, her name will be removed from the 'Unapproved Employees' list and she will be listed on the 'Approval Tree' with John Boss showing as approving her Holiday. 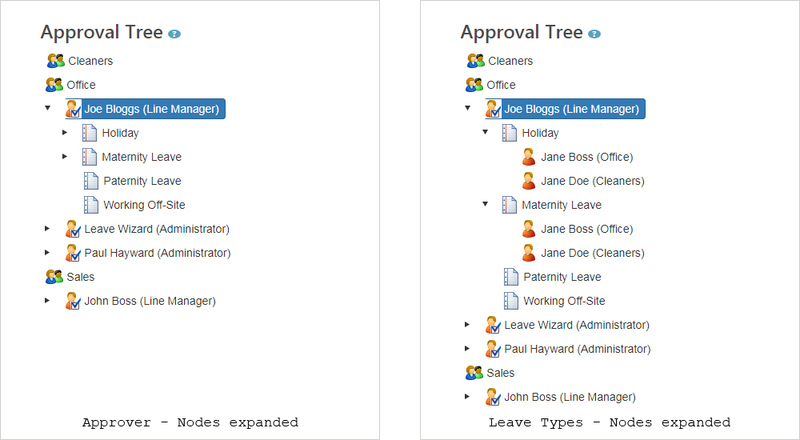 This section shows the approver setup as a tree structure with workgroups at the top level, then the approvers that have already been assigned for each of the workgroups, followed by the leave types and finally the employees whose leave is being approved. You can double click on a Workgroup name to expand or collapse the list of approvers for that Workgroup. You can double click (or click on the arrow to the left of) the Approver name to expand or collapse the list of leave types they approve. And finally, you can double click (or click on the arrow to the left of) the leave type name to expand or collapse the list of employees that the approver approves for that leave type. If you right click on an approver or employee on the Approval Tree a pop up menu appears. For Approvers, you are given the option to change their company status. 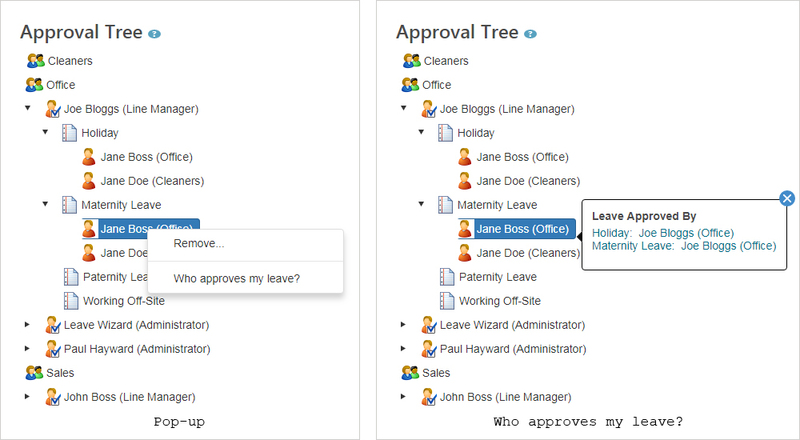 For employees, you can remove their approval for a given leave type and approver from the tree. For both approvers and employees you can click 'who approves my leave?' and get a pop up showing a list of all the approvers for each leave type for that user. This section lists all the secondary (2nd level) approvers. If you right click on a secondary approver name on the list, you get a pop-up menu which gives the option to add a new secondary approver, edit the approver or remove the approver. If you want to remove the approver, just click 'Remove' and the approver will be removed. If you select 'New Secondary Approver' or 'Edit', you will be taken to the 'Secondary Approver User Group Details' page. With the 'New' option the page is blank and with the 'Edit' option it is pre-filled with the current secondary approver settings. You can also double click the Secondary Approver name to expand or collapse the list of Employees they approve. 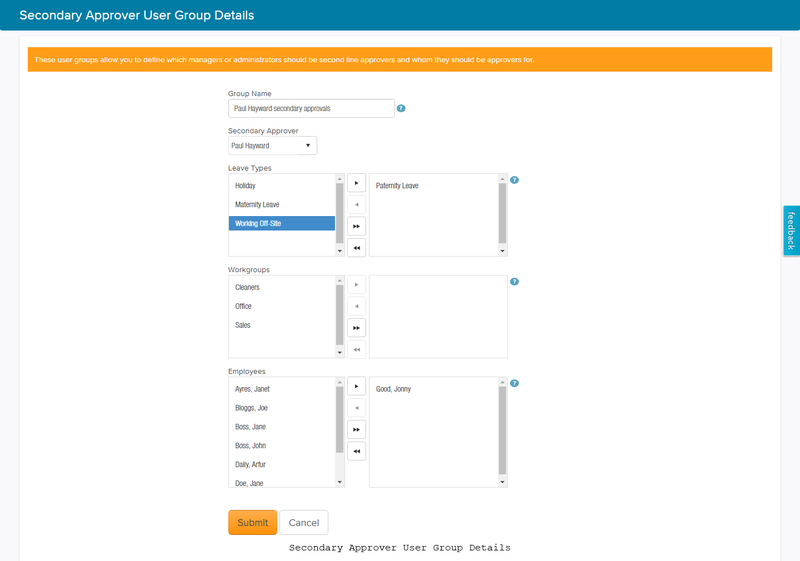 The 'Secondary Approver User Group Details' page has six sections. We will now examine each section and it's associated settings in detail to allow you to configure secondary approvers correctly from the page. This field allows you to enter a name for the user group. If it has been generated by the system, it takes the form ''secondary Approver' secondary approvals', i.e. If the 'Secondary approver' is Paul Hayward then the 'Group Name' would be 'Paul Hayward secondary approvals'. This setting allows you to select an Administrator or Line Manager as an approver from the drop-down box. This section has two scrolling panes listing the available leave types and a vertical navigation bar between them. To add a leave type to the group, select a leave type in the left hand pane and then click the right arrow to move it to the right hand pane. Alternately, to remove a leave type from the group, select a leave type in the right hand pane and move it to the left hand pane by clicking the left arrow. Clicking the double left or double right arrow moves all the entries from one pane to the other. Tip! You can also use 'Ctrl-click' to select multiple users at the same time. This section works in a similar way to the Leave Types section except it is used to select members of workgroups. This section works in a similar way to the Leave Types section except it is used to select individual employees. These buttons allow you to either submit or cancel the entries you have made and return to the 'Approver' page.